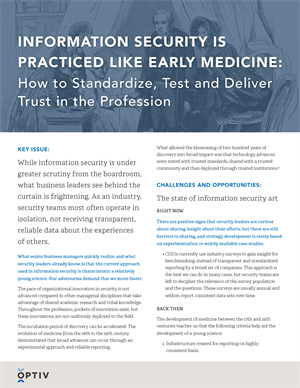 As an industry, security teams often operate in isolation, not receiving transparent, reliable data about the experiences of others. Throughout the profession, pockets of innovation exist, but these innovations are not uniformly deployed to the field. The evolution of medicine from the 18th to the 19th century demonstrated that broad advances can occur through an experimental approach and reliable reporting.